Hey guys! Bubble tea seems to be all the craze these days, so this week we will be doing a lot of ‘tea’ ranges. today’s recipe will be for a bubble tea inspired cold process soap. In this recipe we added neroli essential oil, basil, sage and mint essential oil and almond oils to an oil mix with distilled water. An oil mix is the combination of olive, coconut, castor and palm oil and has many benefits to your skin. For example, olive oil is rich with antioxidants and is a great antibacterial. This helps reduce acne (the one with pus), and has an anti-aging effect due to its moisturising abilities, making your skin look super healthy and radiant. Neroli oil reduces inflammation of the skin and also has antimicrobial properties. In addition to that, it also has a pleasant aroma. In addition to having anti inflammatory properties, basil, sage and mint essential oils is also rich with antioxidants, which is anti ageing agent. Almond oil is rich with Vitamin E which keeps your skin healthy. However, if you are allergic to nuts; you can elimitae almond oil frm the recipe. Finally; we Add yellow iron oxide and titanium dioxide mica to replicate the color of the bubble tea. 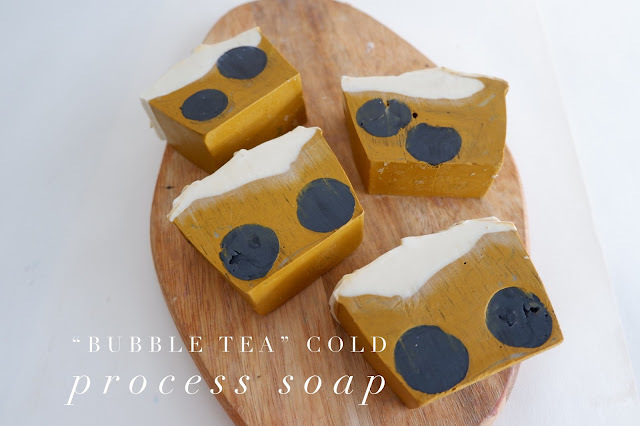 To make it aethetically gorgeous, we added melt and pour soap balls made the day before using ice molds which will act as the bubbles in the tea. Separately, pour your Oil Mix into a heat resistant mixing container. Once there, add in Neroli Essential Oil into the mixing container. Next, add in Basil, Sage & Mint Essential Oil. Mix to combine the 2 oils into the mixture. Split soap into 2 parts. In one of the container, Add in Titanium Dioxide that has been diluted with 10g of Almond Oil and mix. In the other container, add in premixed Iron Oxide Yellow into the mixture and mix to combine. Pour in the remaining yellow soap mixture into the mold. Gently tap. Add in all of the white soap mixture on top. Using a spatula, create soft peaks. Leave soap to harden for 24 hours. Once soap is ready, remove soap from the mold carefully. Using a soap cutter of a normal knife, cut soap according to desired size.